I'm not sure whether the Auto Row area along Broadway exactly counts as a "neighborhood", but it's certainly an identifiable area of Oakland with all of the car dealers and ancillary businesses including automobile repair and service shops. My 1985 Jetta went to Fritz & Peter's car repair shop for many years when I lived in the East Bay and well into my Chico years, too. OK, Auto Row may not be highly scenic but it's a significant part of Oakland's commercial life. Oakland's Uptown area is to the immediate north of downtown. This is also the area where the race ends on Telegraph Avenue. The area is gentrifying rapidly west of Broadway with the recent building of apartment and condominum buildings, the restoration of the long shuttered Fox Oakland, and the opening of new bars and restaurants such as Luka's Taproom & Lounge at Broadway and Grand. One of the most exquisite Art Deco buildings you'll ever see is the Paramount Theatre on Broadway. Nice on the outside, but unbelievable on the inside, this gem had the misfortune of opening during the depths of the Depression in 1931. Don't have the cash for a concert? Well, go to see a "Paramount Movie Classic" that costs only five bucks, and includes a chance to win cool prizes with the Dec-o-Win drawing before the show starts. Just two doors down from the Paramount is the splendid (and derelict) I. Magnin building. The start of the Oakland Marathon is in the heart of downtown Oakland at Broadway and 14th Street. You can see from the inset image from the course map that the finish line is very close to the start, which makes for easy logistics. Two hotels, the Oakland Marriott (official race hotel and site of the expo) and the Courtyard are only two blocks from the race start. For Bay Area runners, the Oakland City Center-12th Street BART station makes for easy transit access, far easier than driving and parking, considering the road closures necessary to conduct the race. Oakland's restored Beaux Arts City Hall is opposite the start of the race. Note the beautiful oak tree in front of the building. It puts the "oak" in Oakland. One of the best newsstands I know of anywhere is the venerable DeLauer's on Broadway. Old Oakland, an area of restored Victorians, and now thriving with restaurants, shops, offices, and condos, is slightly to the south of the race start and west of Broadway, while bustling Chinatown is immediately east of Broadway. How to hide a marathon. Strangely, no one seems to know for sure what the last year of the old marathon was. 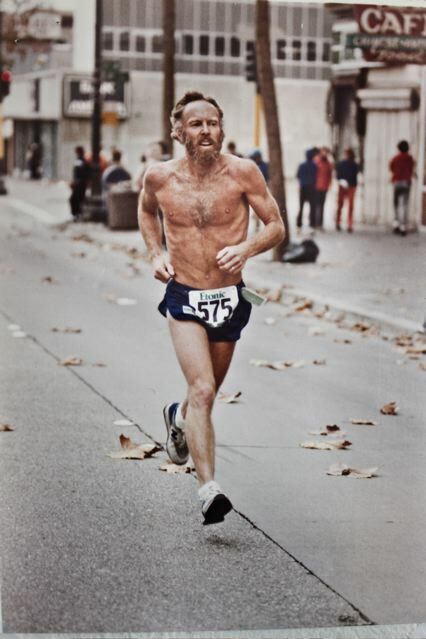 Len Goldman, longtime member and past president of Oakland's oldest running club, the Lake Merritt Joggers and Striders, narrows it down to either 1983 or 1984. That's as close as anyone I contacted could say. If anyone reading this post knows for sure, please comment back and shed some light on what could be a Hardy Boys book: "The Case of the Missing Marathon". Going through the file of clippings labeled "Sports - Track & Field" at the History Room at the main branch of the Oakland Library one sees various newspaper articles about the early years of the event but nothing past 1981. Seems that it had a bright future but abruptly vanished, possibly with a whiff of scandal. 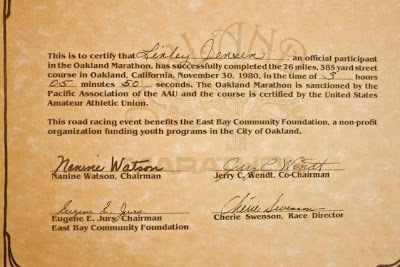 A fine article in the East Bay Express appearing shortly before the inaugural 2010 Oakland Marathon, describes the prospects for the new event, along with some history about the old one. About a year after I originally wrote this post, I was at a 80th birthday party here in Chico for my friend, Lin Jensen. 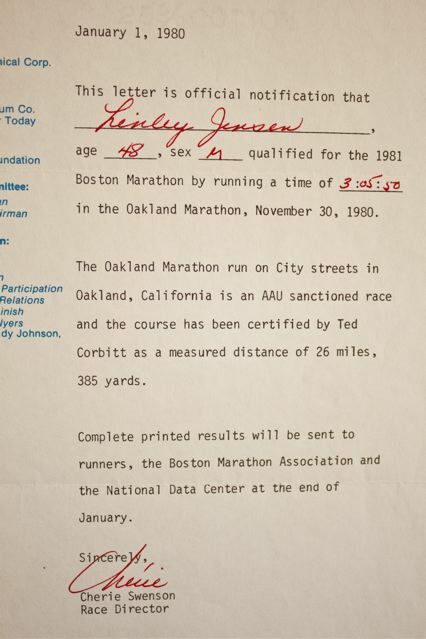 Much to my surprise, on the wall with photos and other significant ephemera from his life so far, was a photo of him running the 1980 Oakland Marathon as well as a letter from the race director certifying his achieving a Boston Marathon qualifying time (3:05:50 at age 48!). Lin graciously authorized my including these in this post. Photos by Karen Laslo. 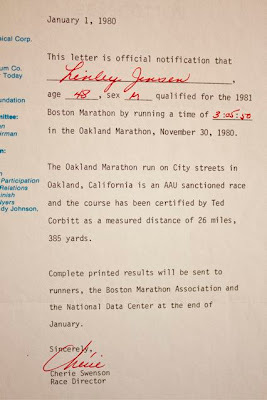 At the History Room I was able to photograph a 1980 marathon program (produced after the race), as well as the entry form for the same event. While it's sad (and mysterious) that the original event did not have staying power, the course of the new marathon is vastly improved. The old marathon's mileage was concentrated on an out-and-back course from downtown to the vicinity of the Coliseum. The new course takes runners on a grand tour of the city that is both more scenic and more challenging. The next post in the "Oakland Marathon neighborhood tour" will be the beginning of the tour in the heart of downtown Oakland at 14th and Broadway. Industrial wasteland. Dysfunctional school system. Confusing freeways. Ugly sister of the glamorous, cool, beauty queen across the bay. Just no reason to go there unless you want to get mugged. That’s all Oakland is, isn’t it? Maybe it is if you want it to be, or if you just don’t know better. To adapt Gertrude Stein's quote: "There is a there there." I’ve lived in Oakland twice in my life. Once for about 6 months in 1979 in my early 20s, and then again from 1990 to 1998 before I moved to Chico, Calif. Because I’m frequently back in the area, I still feel completely at home in Oakland and the East Bay. Is Oakland a victim of character assassination? No. There are reasons behind the reputation it has. In fact, a friend and client of mine was recently robbed at gunpoint in the nice neighborhood where she lives. The problems are real. But they don't tell the whole story by any stretch. Let me tick off the reasons why I’m fond of Oakland. 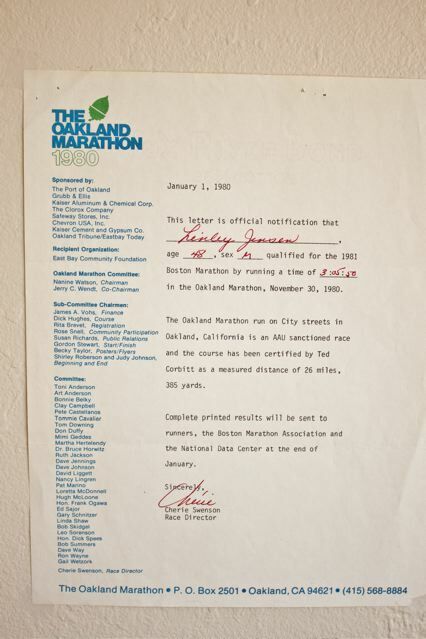 As in many other cities in our Golden State, you will see plenty of runners in Oakland - around Lake Merritt, on the trails in the Oakland Hills, in the neighborhoods – however the last running of a marathon was long ago in the mid-1980s. That was until Gene Brtalik moved here because his wife took a job in Oakland. Lucky break for Oakland, because Brtalik, an event director with Corrigan Sports Enterprises based in Baltimore, saw in Oakland many similarities to Baltimore: an unloved "second" city that would embrace an event that showcased the city in all its mottled glory. Brtalik and Corrigan Sports should know. They faced skepticism when they launched the Baltimore Running Festival in 2001. 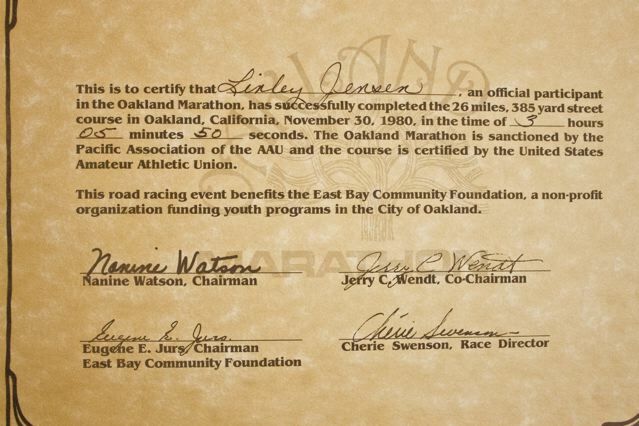 Since then, the event has become hugely successful, both for runners and the community. Not counting this year’s race in October, since 2001 over 100,000 runners have participated in one of the Baltimore events: marathon, half-marathon, 5K, 4-person marathon relay, and kids fun run. They saw the same potential for the Oakland Running Festival, and got the inaugural event off to a smashing start the weekend of 27-28 March 2010. By the accounts of everyone – runners, residents along the route, city officials – the races came off flawlessly and the community turned out in droves to support it and their city. I didn’t get in on the ground floor but at least I’ll catch it at the mezzanine; I’m running the 2011 Oakland Marathon on 27 March 2011. For a couple of years I’d thought it would be fun to write a series about Oakland’s neighborhoods but never got around to it. Now inspired by the race, I am. I’ll follow the route of the marathon and focus on the neighborhoods it traverses. Different in style from most of my posts, these will be short pieces: just a few paragraphs to accompany pictures. I’m calling the series the "Oakland Marathon neighborhood tour". I heartily encourage Oakland residents to post comments with insider knowledge of what makes their neighboorhood noteworthy, good, bad, or otherwise. It could be a special coffeehouse, restaurant, or bar, a nice walk, notable views, history, you name it - just write about it. This series will run concurrently with the Amtrak series and anything else I throw in along the way. But to make it easy to move from chapter to chapter, at the bottom of each post you'll see "Oakland Marathon neighborhood tour navigational links" that give quick access to the previous or subsequent chapter, as well as to the index of all chapters, the series introduction, and to the Oakland Running Festival's own website. And if you're a runner, why don't you give some thought to joining me at the Oakland Running Festival for your own self-propelled tour? In addition to the marathon, there is a half-marathon, 4-person marathon relay, and 5K. I hope this series demonstrates that Oakland is more than a place you have to go through in order to get somewhere else. Before the neighboorhood tour starts, I'll write a short "prequel" post about the original Oakland Marathon. Let’s move from south to north. 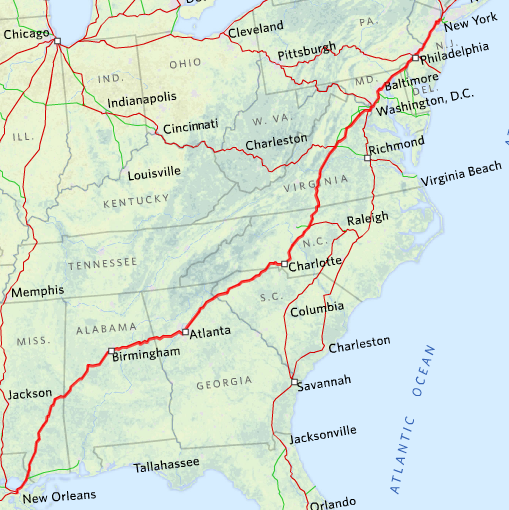 With one exception that I’ll identify, all trains from the west coast to points east (Chicago or New Orleans) take 3 days and 2 nights to reach their destination. For example, if you left Seattle on a Thursday you would arrive in Chicago on Saturday. Two trains, three if you look at it differently, begin in Los Angeles and head east to Chicago and New Orleans. One train leaves from Emeryville (Oakland/San Francisco) bound for Chicago. One more leaves begins in two separate sections from Portland and Seattle, but becomes one train in Spokane for its run to Chicago. 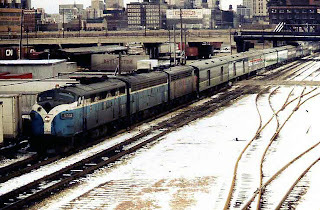 The Southwest Chief, the descendant of Santa Fe’s Super Chief, operates between Los Angeles and Chicago, with principal stops in Flagstaff, Albuquerque, and Kansas City. For a good deal of the trip, this train parallels the old Route 66. This train traverses the classic scenery of the Southwest before reaching the vast flatness of Kansas and beyond. Some Amtrak passengers may remember when this train ran all of the way to Florida (first to Jacksonville, then later to Orlando). The service to Florida was suspended after damage to tracks along the Gulf Coast as a result of Hurricane Katrina. 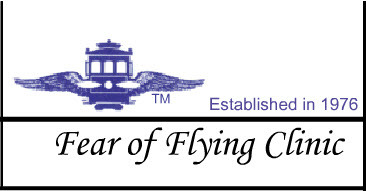 Though the damage was long ago repaired, the service to Florida never resumed, and as of this writing (July 2011) there is no indication at all that it ever will. The third eastbound train from Los Angeles, the Texas Eagle, isn’t a train of its own when it leaves; it’s part of the Sunset Limited. This requires a detailed explanation. The Texas Eagle is a daily train that operates daily from San Antonio to Chicago. Important stops include Austin, Fort Worth, Dallas, Little Rock and St. Louis. 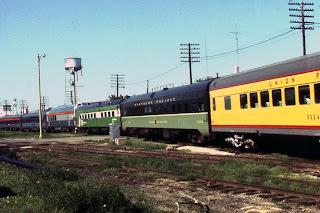 Three days a week a sleeping car and a coach that begin their trip in Los Angeles headed eastbound on train 2 (the Sunset Limited) are uncoupled in San Antonio and then coupled to train 22 that leaves San Antonio headed to Chicago. 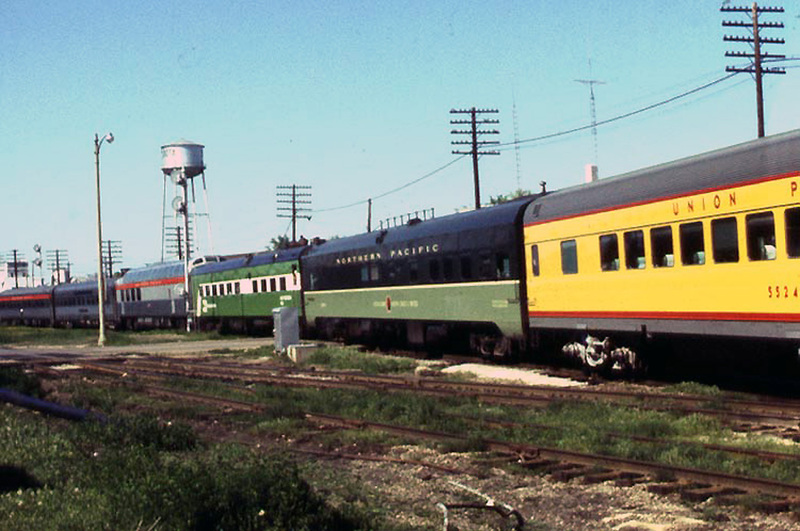 A passenger in a Chicago-bound sleeping car or coach does not have to change trains in San Antonio, because the car itself gets switched from one train to the other, but because of a 9 ½ hour layover in San Antonio it makes for longer overall travel time from the origination in Los Angeles to a final destination of Chicago. (The process works in reverse for westbound travelers, with cars that begin in Chicago being uncoupled in San Antonio and coupled to westbound train 1.) This is the one train that would produce a 4 day, 3 night overall travel time from the west coast to Chicago because of the more circuitous route and long layover. Passengers booked eastbound on the Texas Eagle between Los Angeles (and intermediate points up to but not including San Antonio) to cities beyond San Antonio as far as Chicago are typically booked on train 422. In reverse, they are booked on train 421. The California Zephyr, heir to the name of the renowned train that did not even live to Amtrak day (discontinued March 1969), runs between Emeryville (Oakland) and Chicago. (San Francisco is served via a bus connection from Emeryville to San Francisco over the Bay Bridge.) Noteworthy stops include Sacramento, Reno, Salt Lake City, Grand Junction, Denver, and Omaha. This train is considered among the best for scenery because of the rugged crossing of the Sierras and the long stretch along the Colorado River and in the Rockies. 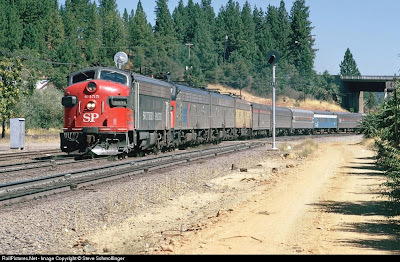 Unlike the original postwar California Zephyr, the train does not traverse the Feather River Canyon (except for the very rare detour) but instead runs on the former Southern Pacific Donner Pass route, which was part of first transcontinental line when completed in 1869. The last of the western long-distance trains is the Empire Builder. The name of the train was inherited from the railroad that created it, the Great Northern Railway (later part of Burlington Northern), which named the train after its founder, James Hill. In his day Hill was dubbed the "Empire Builder". Headed eastbound, the Empire Builder begins its journey as two trains. Train 8 with coaches, sleeping cars, and a dining car, originates in Seattle headed north to Everett where it makes an eastward turn and crosses the Cascades bound for Spokane. Train 28 on the other hand starts in Portland, crosses the Columbia River over to Vancouver, Wash., and then makes its eastward turn to run along the Columbia for about 200 miles to Pasco, Wash. The Portland-originating section of the Empire Builder includes coaches, sleepers, and a lounge car. It continues to Spokane for a midnight rendezvous with the Seattle-originating train 8. In Spokane, the two trains are coupled together to become one train operating east to Chicago. Westbound, it works in reverse; the train splits into two pieces in Spokane for the final legs of the trip to Seattle (train 7) and Portland (train 27). Portland-bound and Seattle-bound coaches and sleepers are clearly identified, so it is seldom that a passenger needs to move from one car to another in Spokane. Between Spokane and Chicago the principal stops are Whitefish, Mont., Havre, Mont., Fargo, Minneapolis, and Milwaukee. Like the California Zephyr, this train is highly regarded for great scenery in Oregon and Washington, Glacier Park, the vast reaches of Montana's Big Sky Country, and some pretty landscapes in Wisconsin. By most accounts, the on-board service on the Empire Builder is presently the best among all of Amtrak’s long-distance trains. 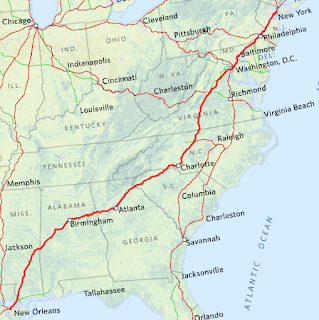 Though many people are not old enough to know this by having lived through it, Amtrak did not invent the passenger train in the United States. 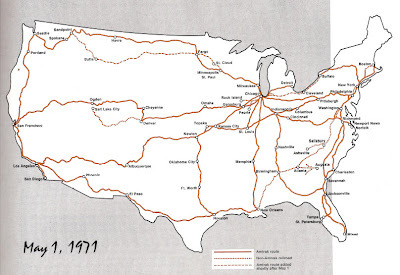 Amtrak was created by the federal government in 1971 to preserve what was left of passenger rail service operated by private railroad companies after decades of decline. A note about the photos you see enlivening this post. The picture above was taken by Steve Schmollinger near Colfax, Calif. in July 1973. 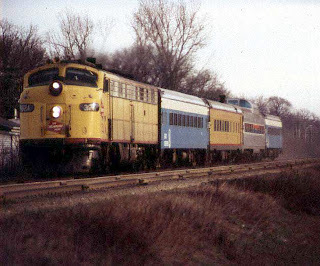 The other photos you'll see from here on are courtesy of Larry Mack, and snapped in the Midwest during the same time period of the early 1970s, which is known as Amtrak's "rainbow era". You'll read why it's called that later. Thank you, Steve and Larry! 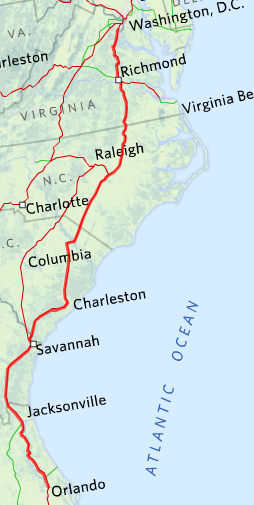 Branch-line passenger service had begun to drop in the 1920s as automobile ownership increased and the reach of paved roads grew. That drop in ridership coupled with the Depression resulted in many short-distance passenger trains being discontinued prior to WWII. During the war, passenger traffic exploded on all lines, in part due to wartime rationing of gasoline and tires, though service was ragged due to unprecedented demand. Although after the war railroads invested heavily in new, streamlined passenger railroad equipment for longer distance travel, by the mid-1950s it was clear that more and more of the public was leaving the rails for the sky or for their own cars operated over the ever expanding interstate highway network. This decline in ridership was not identical from railroad to railroad. 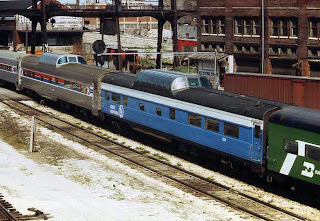 Some fought to retain passengers through enhanced service, but others lost interest altogether and claimed, sometimes dubiously, about the deep losses they suffered operating passenger service. 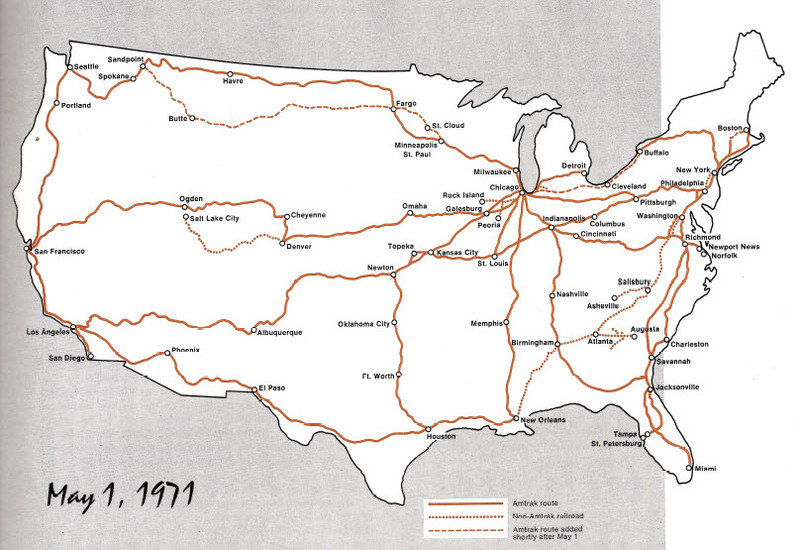 Two western railroads were at opposite ends of the spectrum. On the other hand, the Santa Fe Railway maintained impeccable service standards aboard its trains up until the end. 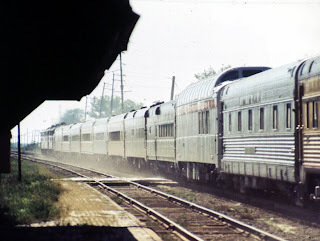 While it did discontinue a number of secondary trains and shorter distance trains, the trains it continued to operate (such as the famous Super Chief between Chicago and Los Angeles) were consistently top-notch. One of the last things that kept many passenger trains in the black – carriage of the U.S. Mail in baggage cars on passengers trains – was largely eliminated in 1967. 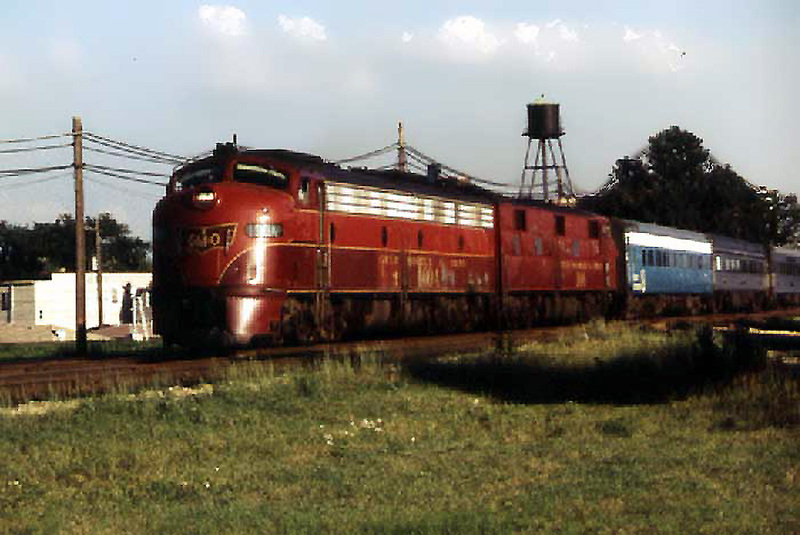 By the late 1960s it was clear to the public and to policy makers that passenger trains were endangered and the railroads were clamoring for some kind of relief: government subsidies, a government takeover of passenger trains, or blanket permission to discontinue any trains they wished. In brief, the plan offered railroads the opportunity to lose their financial responsibility for operating passenger trains by buying into Amtrak with their passenger railroad equipment and cash. 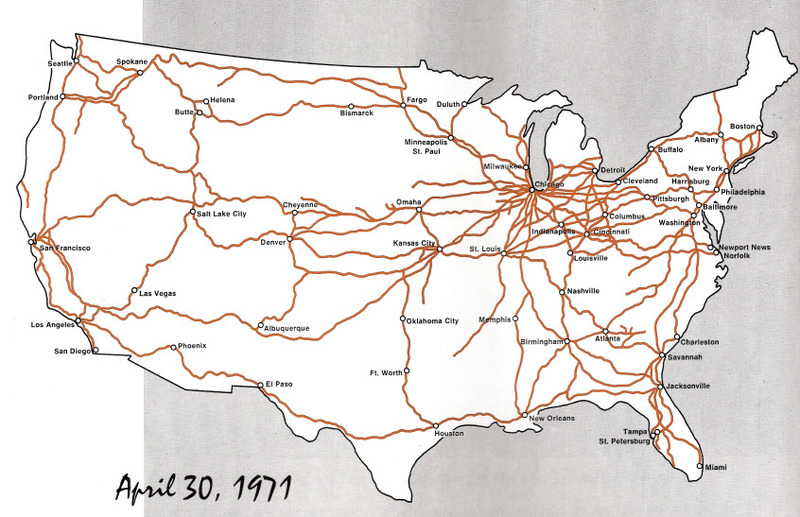 All of the major railroads except three (Rock Island, Southern, and Denver Rio Grande & Western) chose to participate from its inception. As the countdown to Amtrak’s takeover of passenger rail service on 1 May 1971 began, many people began taking their last rides on trains that would not survive the transition to Amtrak. 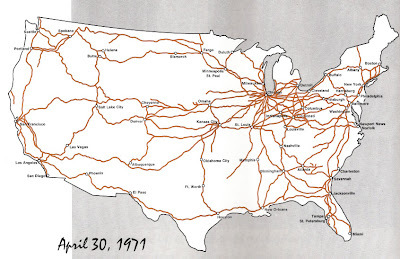 The route network authorized by the bill that created Amtrak was skeletal compared to what the railroads had chosen to operate (or were required to operate) even with all of the train-off notices of the postwar years. 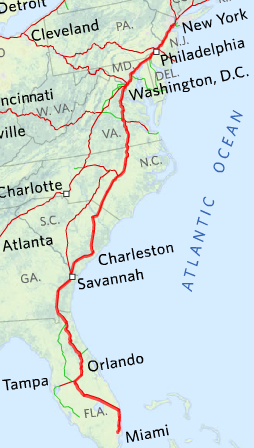 Southern Pacific’s Daylight (San Francisco-Los Angeles) and Cascade (overnight between Oakland and Portland) would be amalgamated into Amtrak’s Coast Starlight running from Seattle to Los Angeles. Other than commuter service to San Jose, San Francisco has been without mainline intercity passenger rail service since 1971, except by way of the Amtrak bus connection to trains in Oakland and Emeryville. The history of Amtrak itself is not the subject of this series as it would easily fill many posts. A few key points are worth noting. Initially most of the employees operating and staffing the trains remained on the payrolls of the railroads, although reimbursed by Amtrak. This gradually changed, but since the late 1980s all of the employees – whether operating employees (engineers, conductors, etc. ), on-board staff (dining car, sleeping car, etc. ), station agents, call-center agents, maintenance, and so on, have been Amtrak employees. Most non-management Amtrak employees are unionized, and represented by the same unions that employees of the now freight-only railroads are. Amtrak employees, like their freight railroad brethren, are covered by Railroad Retirement, a separate system very much like Social Security. It was a number of years before Amtrak ordered its own equipment (locomotives and passenger cars) so the initial years (roughly 1971-1974) are known as the "Rainbow Era", because the passenger cars that the railroads had to contribute in order to join Amtrak ended up being used all around the country. A silver and red Southern Pacific car might be next to a green Burlington Northern car which was next to a golden yellow Union Pacific car. Eventually all of this equipment would be painted in Amtrak’s own livery and look more or less the same. Most - but not all - of this railroad hand-me-down equipment has been replaced by locomotives and cars ordered by Amtrak. Amtrak has a president appointed by the Board of Directors; the Board is appointed by the president subject to confirmation by the Senate. The Secretary of Transportation is an ex-oficio member of the Board. While Amtrak runs its own affairs on a day-to-day basis and is technically a separate entity, it is highly subject to political interference both by friends and by enemies. The federal government provides (some years) capital investment funds and annually supplies an operating allowance to make up the difference between revenue and expense. Decisions about adding or cutting routes, have invariably involved input from Congress. Historically the Democratic Party has been more inclined to support Amtrak, and the Republican Party to disdain it, but exceptions to that rule render it only a rough guide. Under President Jimmy Carter several Amtrak routes were axed and Republican stalwarts former Senator Trent Lott and Senator Kay Bailey Hutchison have been two of Amtrak’s best friends. Though invisible to the traveling public, Amtrak’s headquarters is in the upper floors of one of the nation’s busiest and prettiest train stations: Washington Union Station. And coincidentally or not, the U.S. Capitol is just a few blocks walk in distance. Amtrak is not the name of the corporation. In fact, the official name is the National Railroad Passenger Corporation, but it has always done business publicly as Amtrak.